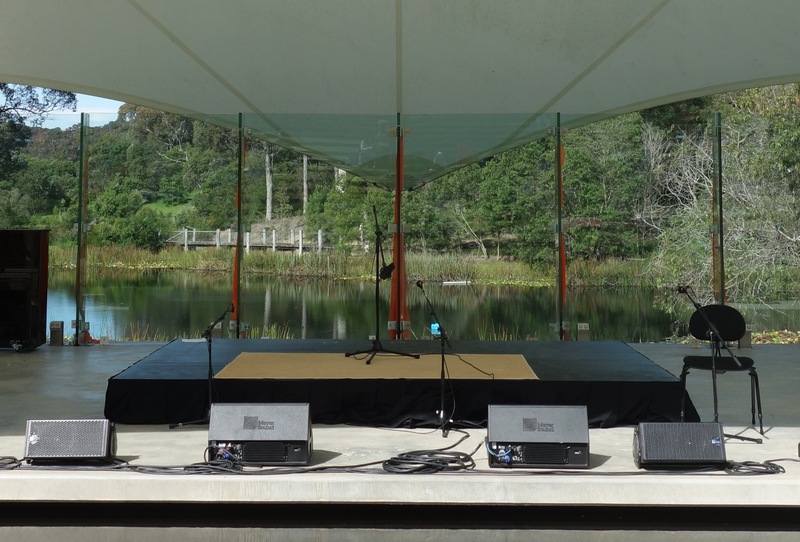 When I was in Warsaw, one of the things I missed was performances at Four Winds, a wonderful site near Bermagui, with a soundshell and a pavilion in a bushland setting. 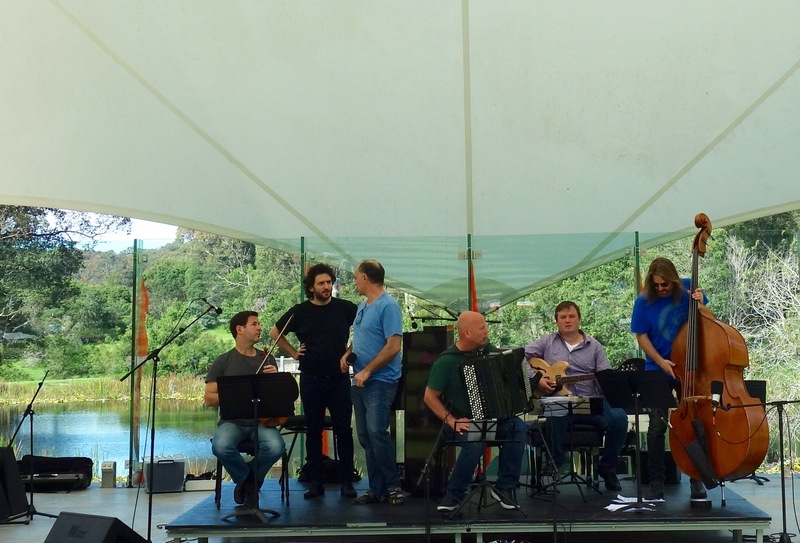 The Four Winds Easter offering is Latin spirit, music with a Latin American flavour, with workshops in flamenco, tango and Latin rhythm in the weeks leading up to the fiesta. I pack my lunch and my low folding chair and arrive in time to watch the preparations: arranging the stage, testing sound levels, and preliminary performer chat. 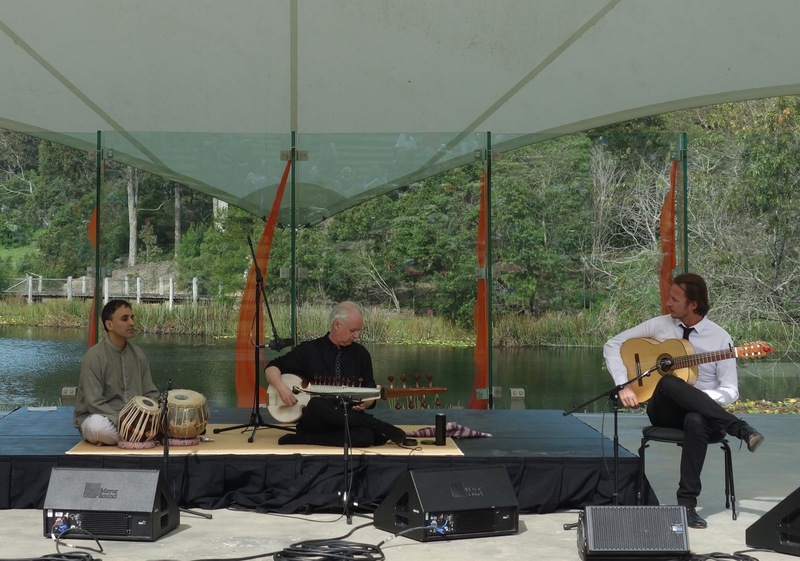 The first set is a surprise: a meeting of Hindustani music and flamenco, played by Rasa Duende on tabla, sarod and flamenco guitar. Between reflecting pool and lagoon. Eyes and subtle nods conduct their improvising. My arm hairs rise in gentle breeze. 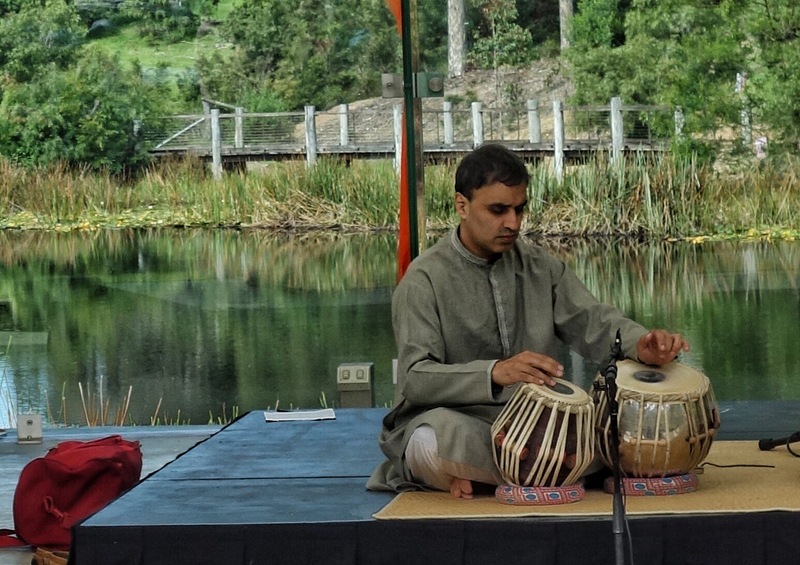 Sun warms the skins of drum and sarod. 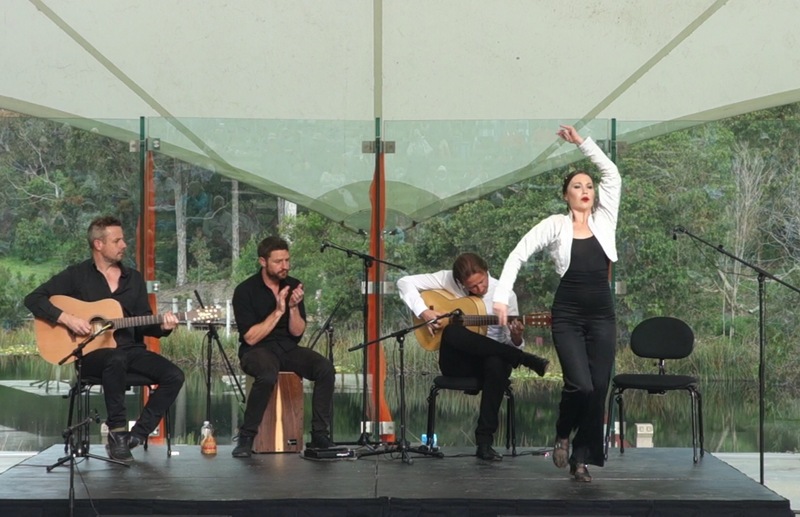 … featuring a flamenco dancer. 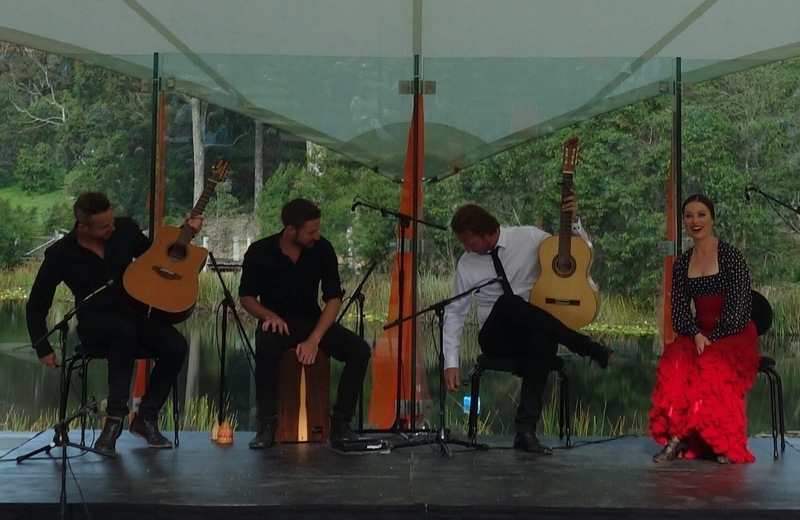 She sits on stage with her Bandaluzia musicians – a percussionist with an instrument that looks like a speaker box, which he sits on nonchalantly, and two flamenco guitarists – frilled in red flamenco garb, clicking her fingers till it’s time to dance. Which she does with grace and vigorous snicking of flamenco heels. She changes into sleek black with a white bolero for her second dance. 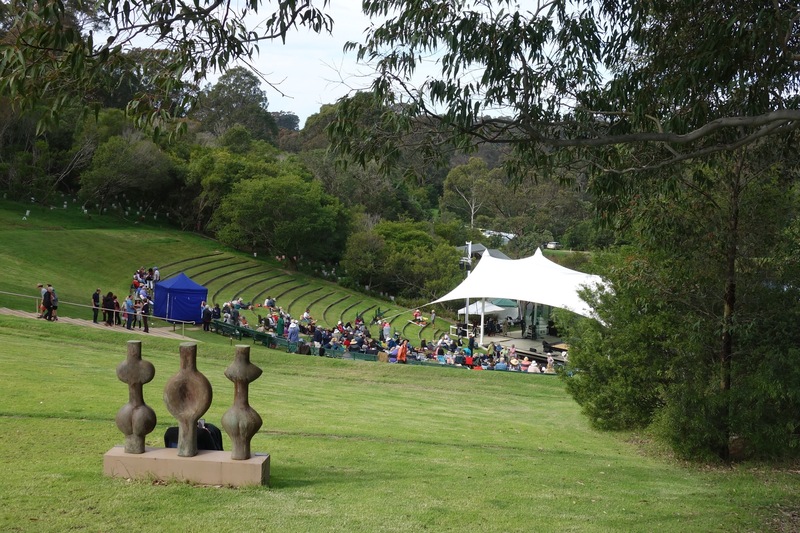 Then there’s a final set, starring Opera Australia baritone José Carbó, accompanied by a group consisting of piano accordion, (played by James Crabb who is also the current artistic director of Four Winds), pianist, violinist, guitar, and double bass. My last encounter with an accordion was in the old town square in Warsaw, where it was played by a man with a fierce face and a bristling moustache. 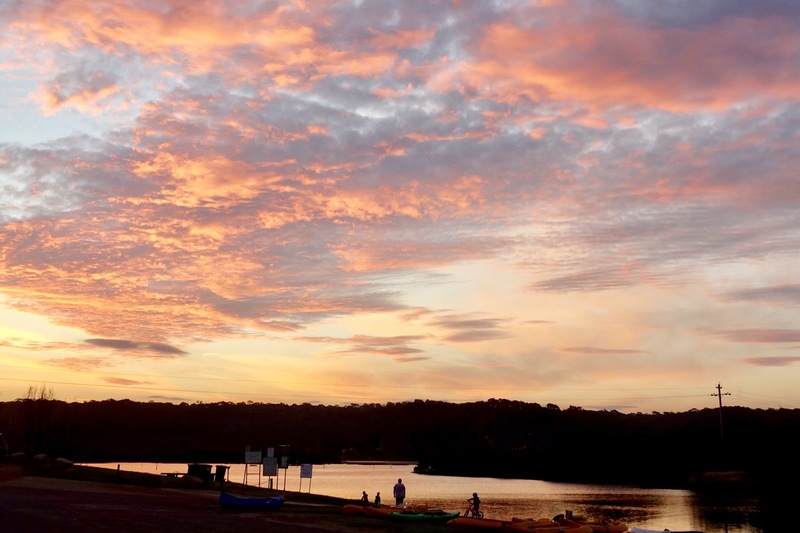 The afternoon of music ends with a festive sunset over the water as I drive home into darkness and silence. For the movie see a separate post.